Our distinctive Yancy Cobler (Our Designer) series bed has a hint of "Arts and Crafts" and yet "Mid Century" details and materials. 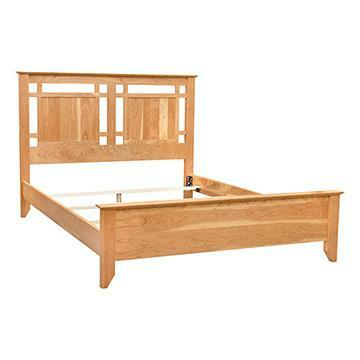 The bed as shown is Solid Pennsylvania Character Cherry Wood and finished on a Near Natural bar top satin finish. Also available in Walnut, Red Oak, Quarter-Sawn White Oak, Brown Maple, or any way you like. A variety of finish options are also available.